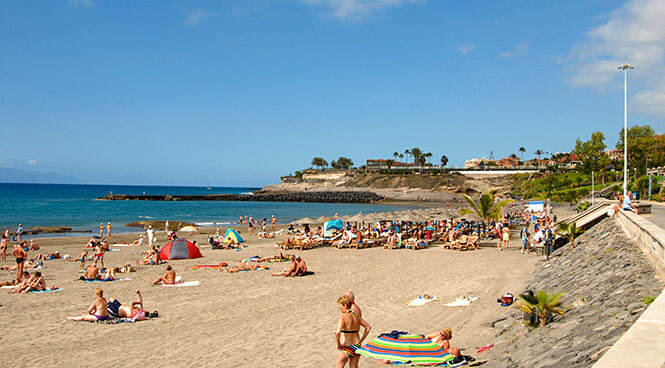 Fanabe, the stretch of coast between Playa del Duque and Puerto Colon, is pretty much what you would expect of any sunny beach resort, with lots of hotels and restaurants lining a long beach that is a bit two-tone thanks to a mix of natural black and imported golden sand. Puerto Colon itself has multiple personalities. It's a marina with sleek, expensive yachts and is the best place in the area to arrange whale and dolphin watching trips or diving with a difference using a BOB (breathing observation bubble). The bars at the back of the marina generally cater for holidaymakers looking for British breakfasts and cheap drinks whilst a delightfully kitsch lighthouse on one headland lights up Faro Chill Art. It's one of the coolest bars on Tenerife that, ironically given its holiday resort location, is more popular with Canarians than it is with holidaymakers. Your villa in Fanabe is the ideal base from which to explore the island. You could start with La Laguna, Tenerife's second most important city and former capital of the island until 1723. The city is full of interesting buildings including San Fernando University and the Bishop's Palace as well 17th and 18th century houses with brightly-coloured facades, elegant churches and an impressive cathedral. The city is surrounded by the luscious countryside of the Aguere Valley, just inland from Santa Cruz. If you like dramatic mountain scenery you could visit Masca, a small picturesque village with a total population of around a hundred people. Or you could check out mysterious Piramides de Guimar, a group of six stepped pyramids on the East Coast of the island. No one knows for sure how or why they are there. It is also worth spending a day in the capital Santa Cruz which is less than an hour away and has good shops, a spectacular new opera house on its waterfront and some great cafés and restaurants. Torviscas is the place to try some authentic Canarian food. Good fresh fish such as samas, snapper, haddock and sea bream is widely available but you could also try local specialities such as such as paella, bean stew, and of course tapas. Or try traditional dishes such as papas arrugadas - wrinkly garlicky mojo potatoes- and Canarian style chicken with a dollop of mojo sauce on the side. Mojo sauce can be very spicy as it’s made with red chilli peppers, so beware!